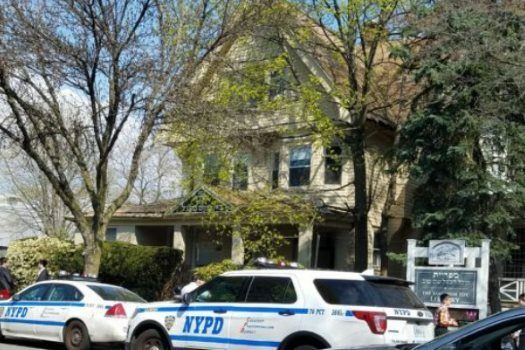 An arrest has been made by the NYPD over the break-in to a Chabad synagogue in Flatbush and the subsequent assault and robbery of its caretaker. 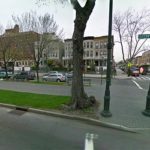 An arrest has been made in the assault and robbery of a Chabad Shul caretaker in Flatbush. Sources tell YWN that a suspect was taken into custody early Wednesday morning in connection with the violent attack. As YWN had reported on Sunday, the NYPD was looking for two men who broke into the Chabad Shul on Avenue J and East 17 Street and proceeded to the third floor apartment. 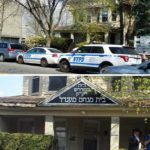 They broke the door down and assaulted a 45 year old victim – who is the caretaker of the Shul. He was hit with a broom stick and suffered a laceration to his head. His cell phone, computer and $300 in cash was taken. Flatbush Hatzolah transported him to a local hospital where he was treated for his injuries. The NYPD took the incident very seriously and utilized all resources in the case. Thanks to the diligent work of the Detective Squad as well as the Commanding Officer of the 70 precinct, Deputy Inspector James Palumbo, an arrest was made on Wednesday morning. The identity of the suspect as well as charges have not been announced as of this time. A second suspect is being sought. Flatbush Shomrim assisted the NYPD is retrieving lots of security camera footage in the vicinity of the Shul. Police told YWN at the time of the incident that it did not appear that this was in anyway a hate crime, and believed this was an isolated incident. So it was a love crime? No, it was just a normal crime like any other housebreaking. Why would you have expected it to be a hate crime? What, did you think these people hate Jews so much that they beat and robbed a fellow goy just because he lives above a shul? No, they did it because they’re criminals, and they’d do exactly the same to anyone else. Yeah, right millhose. It’s not a hate crime they just randomly pick a house to rob which happened to have big Hebrew letters in front. I agree with Milhouse, not every crime against Jews means it was motivated by hate. You assume that they chose this building simply because of the large Hebrew letters on the front, but perhaps they did not go past the front of the building? maybe they snuck in from property to property until they found a house that was vulnerable? Crying hate every single time does nothing for the times that it truly is hate. Yes, “what”, they did choose it randomly. No, they didn’t “sneak from property to property”. I’m sure they saw the hebrew letters, but so what? Why would the knowledge that it was a Jewish house stop a non-antisemitic criminal from breaking in? Do you think they’re so stupid as to imagine Jews have nothing to steal?! u are dan lchaf zchus these low lives robbers? do u do that for all yidden? they attacked and beat the jewish man inside the house, don’t tell me they were looking for an easy vulnerable target. they clearly saw the big Hebrew letters in front and chose that house because of their great hate and jealousy of the JEWS. Be proud to be Jewish. Don’t hide it. Correction, The caretaker is a frum yid. “vice”, accusing people of antisemitism with no evidence whatsoever is paranoia, which is a mental illness for which you should seek treatment before it leads you to hurt someone. millhose thanks for the free diagnosis. seems like u and your pride are the only ones who are hurt so please feel free to continue to medicate yourself as usual. btw those two thugs are jew haters but since you are wearing your liberal blinders all seems nice and rosy to you. You have still not produced a shred of evidence for your paranoid persecution fantasies, and yet you remain convinced of them, thus confirming your mental illness. If left untreated this can only end in your attacking an innocent person because you perceive him as a threat. The Shul has the name ‘Beis Menachem Mendel’. It was an attack on the Rebbe and Lubavitch. Whether the thugs knew it or not.